And in light of International Women’s Day, we’d like to shine a spotlight on Girls Rock MTB Santa Cruz, a non-profit organization that supports female mountain bikers of all ages and riding levels. Read on for an excerpt from the Girls Rock website, and save the date for an upcoming Girls Rock ride hosted by Epicenter’s Santa Cruz store on June 22, 2019. We love hosting Girls Rock rides and supporting the women in our cycling community … so you can count on a fantastic time! It all started in the parking lot near Santa Cruz's Emma McCrary trailhead in spring 2014. Founder Jessica Klodnicki spotted a fellow [Trek] Dirt Series camper Juliann Klein. Thanks to Juliann's love of purple, Jessica immediately recognized her from camp. Of course, Juliann wasn't hard to miss ... purple handlebars, purple pedals, purple shorts and helmet! We had four girls show up to the first ride. The next month, it was 12. Then 12 became 20. By ride #4, we had named ourselves Girls Rock. With each ride, friends told their friends, and we collected more women riders on the trail. By ride # five, our "Halloweeny ride," we were legit. Commuters, roadies, and pleasure cruisers … We know you LOVE your bike. Your bike makes you feel like a hero! You know the feeling: the air is crisp, and you feel the energy of each pedal stroke diffuse deep into your bones ... you're flying high, Superman cape streaming behind you. And you ARE a hero. You take time to make time for your healthy lifestyle. To those who seek a strong life balance, you are the example. When you get on your bike you feast on fresh air, finding focus and inspiration — all of which give you the energy to be the best that you can be. To support you in being the conscientious hero you are, we’d like to offer some tips on maintaining the health of your steed. When we suggest checking over your bike before a ride, we don’t mean ten minutes before you are heading for the trail head. Schedule some time when you won’t be rushed, and also have an opportunity to get something fixed if necessary. Place hands on grips, press down with weight, and try to rotate them back and forth. If your handle bars have any movement make sure to tighten. This can be done very quickly at home with a 3-way hex wrench, usually 4 or 5 mm. Long-term maintenance tip: Every year, lube the screws that connect the handle bars to headset with a squeeze of Park Tool grease + a Q-tip. Retightening the stem clamp bolts with a Park Tool 3-way hex wrench. This is the gap area where the headset meets the frame. To check, hold the front brake and rock the bike back and forth. If you feel any movement or play, first loosen the stem clamp bolts and tighten the screw at the top of the stem to a quarter turn more than finger tight. Then, straighten the handlebars and retighten stem clamp bolts. These include: headset (feel for roughness, or vibration); front wheel (hold fork and spin front wheel; should spin nice and freely, no roughness); pedals (should spin freely, no noise); bottom bracket; rear wheel. If this sounds like Greek to you, come by and we’ll demonstrate. Check the brake caliper bolts; make sure they are tight. Check pads for wear; make sure the pads are present and aligned, each pad an equal distance from the rim or rotor. Ideally, the wear on your pads should be equal, if this is not the case it may indicate an alignment issue. Your brake levers should have enough tension to pull to about one inch from the handle bars. If your pads are worn and/or your levers are loose, we can help you get them adjusted properly. Your brake levers should have enough tension to pull to about one inch from the handle bars. 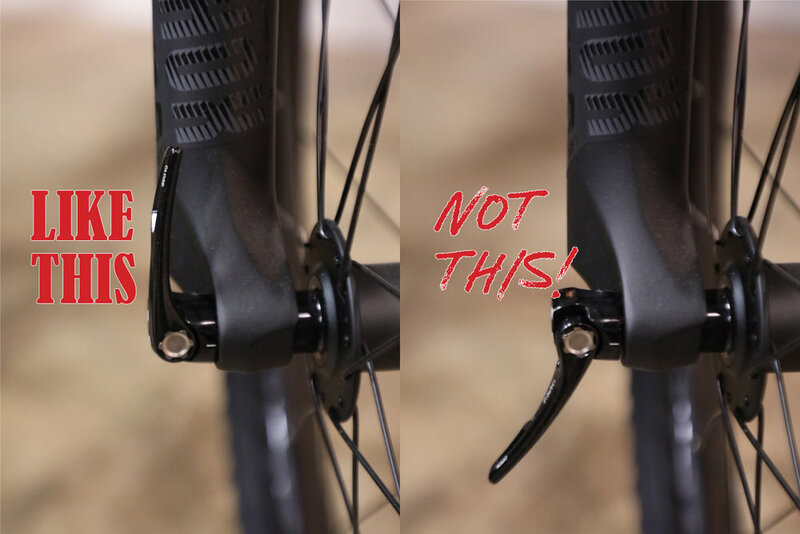 Disc brakes: Ideally, the wear on your pads should be equal. Notice how, in this case, the left side is more worn than the right. This may indicate an alignment issue. This is an example of a toe-in brake. We do this sometimes when the brakes get really squeaky. Make sure your tire pressure meets the minimum psi; this info can be found on your tire. There’s a fine art to running different amounts of tire pressure depending on terrain. We will cover this in details in another post (plus other helpful tire tips! ), but in general, you want to run the psi indicated on the tire to avoid pinch flats and other issues. Be sure look at the tire tread. If tread is visibly bare in center of tire, it’s time to swap it out for a new one. Pop on over and our knowledgeable crew can set you up. 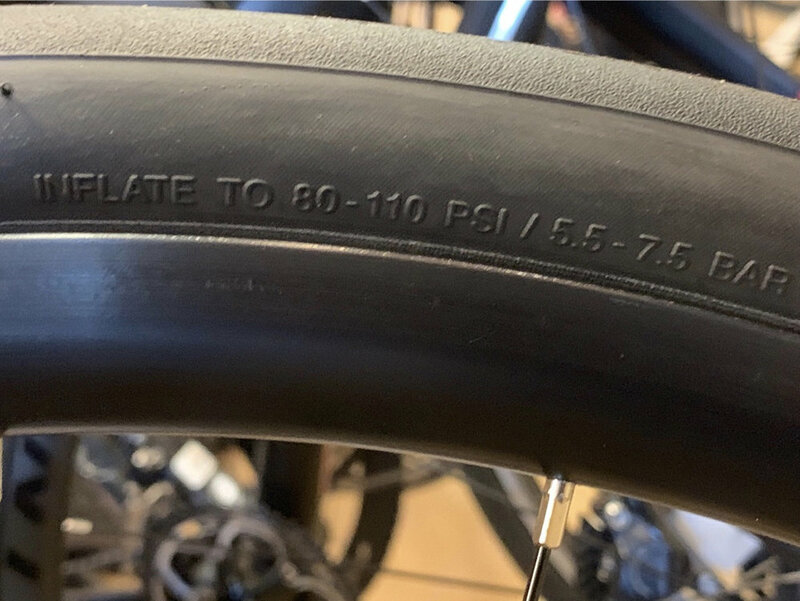 For this road tire, the acceptable pressure range is 80-110 psi. It’s helpful to have a pump with a dial at home. Prior to hopping on your two-wheel vehicle always, always make sure your front AND rear skewers are secure and tight. It’s good practice to set levers to between the 12 and 3 o’clock positions so they cannot be opened while riding. Also, check to make sure the wheel spins straight. If not, come see us before you hit the trail. If you don’t notice a wobble at this checkpoint, but do on your ride (wobbly climb or squirrelly descent), you know it’s hot time to get that rear/front wheel trued. Always, ALWAYS make sure your front and rear skewers are secure and tight. Like THIS. Make sure the seat is properly aligned (by getting on bike or eyeballing), and routinely check to make sure nuts and bolts connecting your seat to the seat post are tight and secure. If you move the seat back and forth and there is any play, you will need to tighten the connecting screws. Also check the seat stay (the ring that holds the post in place). Use a 3-way hex wrench (usually 4 or 5mm) to tighten clamp if needed. Lube your chain at least once per week, and definitely at end of your ride if the bike gets wet or mucky. To effectively lube your chain, first be sure to clean it before applying the chain lube. You can use a chain cleaner such as ParkTool’s CB-4 Bio ChainBrite, or at the very least wipe the chain down with a rag. To apply the lube, backpedal while applying a thin stream to one revolution of chain. If you have a quick release chain link use that as a point of reference to ensure you cover the entire chain. If you do not have a quick release, back pedal three to four full rotations to ensure that full coverage. Before wiping the chain, ride around block, or back pedal for 30 seconds to a minute. Then, use towels to clean dirt/muck from the cassette on rear derailleur. And using a towel, put the chain between your left index finger and thumb (use the bottom chain, moving from cassette to front ring), and use same rotation pattern described above. Too confusing? Feel free to ask our service department for a quick tutorial! Pro tip: We use Dumonde Tech because it lasts the longest and is best in class for protection of your chain. To apply chain lube, backpedal while applying a thin stream to one revolution of chain. Some cross bikes and hybrid commuters boast front suspension. It’s important to take good care of that fork as they can be expensive to replace. When riding regularly you should service your fork at least once per year or every 100 hours of riding, whichever comes first. This is because dust, etc. collects and can wear down your stanchions and internal suspension parts. If you notice a lot of grit, grime, or build up around the seals, it’s time for some professional service. At four months (yes, even in that first year of ownership! ), get the lowers removed and cleaned. At eight months, have the wiper seal replaced (this seal is responsible for keeping dirt out and lube in). At twelve months, get a complete overhaul, which includes draining the old suspension fluid from your fork, removal of the fork’s lowers, and a thorough cleaning of the stanchions and lowers, followed by an installation of fresh seals and oil. If you ride aggressively, and in particularly dusty or dirty conditions (cyclocrossers, we’re talking to you! ), you’ll obviously want to service your fork more frequently. Keep in mind that following a recommended fork maintenance schedule will keep your fork running smoothly for much, much longer than if you don’t. A healthy, happy looking front fork. After your awesome date with your bike, you’ll want to give it some love as well. This might be a great time to run through the checkpoints outlined in the Pre-Ride Maintenance Routine so you are all set for your next ride, instead of scrambling at the last minute because your week got too busy. Use a hose to give it a rinse. Yes, a hose. You may have been cautioned against using a hose to wash your bike, but it’s important to know that spraying water on your bike will not cause damage. It’s HIGH PRESSURE that causes damage and can push out grease from bearings. To avoid this, use a low to medium stream setting and take care not to directly spray the hubs, the bottom bracket, or anywhere with bearings. With this in mind, if you don’t have access to a hose, a water bottle will suffice. Dry your bike off well with a soft, clean towel. An old beach or hand towel works great. See instructions on how to do this in the “Lube Your Chain” section above. Along the way, you’ll want to maintain other aspects of your bike. This section may be a bit more information than you want to assimilate. But don’t worry, that’s why you have us. We’re happy to do the wrenchin’ so you can get out and play! Whether you do it yourself, or put your trusted steed into our capable hands, we can’t emphasize enough the importance of regular maintenance. Worn-out parts degrade other parts, and that means unnecessary, expensive repairs. Regular maintenance will keep your machine running STRONG and smooth. Our Service Team recommends the following TLC. This is your bike’s “motor.” A worn drive chain does not feel good to ride! There are several components to look after in your drive train: the chain, the front chain ring, the cassette, and the front and rear derailleurs. Chain: In addition to lubing your chain weekly, every few months you should check the wear on your chain. There is a special tool for this practice. Even with the most loving use, your chain will loosen over time (typically every 1,000 – 1,500 miles). This will cause increased wear on your cassette and chain ring, which may result in an expensive fix. Proper chain maintenance will extend the life of your front chain ring(s) and rear cassette. Front chain ring: Keep an eye on your front chain ring. If the teeth start to look like little shark teeth (hooked), you should seriously consider replacing the component. Cassette: This component will need replacement if the chain is skipping when you know you have a healthy chain. Derailleurs: Ideal maintenance includes wiping dirt and grime from your rear derailleur after each use. If riding in dry conditions, wipe the pulley wheels with a rag and use a brush to clear dirt in between cassette rings every other use or so. For the front derailleur, you can use a brush to wipe debris from the chain ring and the space between ring and derailleur. The above maintenance is incorporated into tune-up and overhaul packages we offer by our professional mechanics. We recommend that you tune-up your bike at least once per year; more often for frequent riders. Stop by to chat with our crew to determine the best service regimen for your bike. You want your bike to last as long as possible, and the more regularly it is cared for, the better it will perform, and longer it will live. We are happy to guide you on DIY procedures, and on scheduling service. Whether you want to do the service yourself, or bring your bike into the shop, be sure to add regular bike care to your routine. And … did you purchase your bike at Epicenter? Then remember you get unlimited FREE basic tune-ups for the life of your bike! Give us a call to schedule an appointment. In the spirit of Valentine’s Day, we want to help you give your bike the love it deserves. Save 14% on any parts or service you need … and not just on Valentine’s Day the 14th, but throughout the month of February. Get your coupon here. 2019 marks a decade of getting folks stoked on bikes, and our commitment to doing so is stronger than ever. Epicenter was born out of owner Shawn Wilson's quest to promote the joy of riding. Like a lot of kids, Shawn pretty much grew up on a bike, and by the age of 15 he knew he wanted his life to be centered around cycling. He started racing downhill, going pro at 18 as a self-supported privateer with bicycle support from Trek. During that time, the Santa Cruz native also commuted “over the hill” for a part-time gig at a bike shop in Los Gatos. At age 20, Shawn shifted his focus from racing to building a career in retail. He accepted a full-time position at that shop, and it wasn’t long before he became the store manager. When plans to co-own the store fell through, Shawn turned to home turf in his mission to center his life around bikes. Epicenter’s Aptos location was born out of that mission. Every time Shawn took to his local trails at the Forest of Nisene Marks State Park, he eyed a vacant building adjacent to the renowned Aptos Post Office dirt jumps. The site not only offered easy access to Nisene, but — via a heart-pumping fire road climb — Soquel Demonstration State Forest (Demo) as well. Contemplating the riders who converged regularly in the big dirt lot next to the building, Shawn’s imagination went wild with visions of an active hub for cyclists in south Santa Cruz County. He took the plunge and set a plan in motion. With fiancé Kazia Pennino, Shawn meticulously put together a business proposal, and a private investor backed their vision. 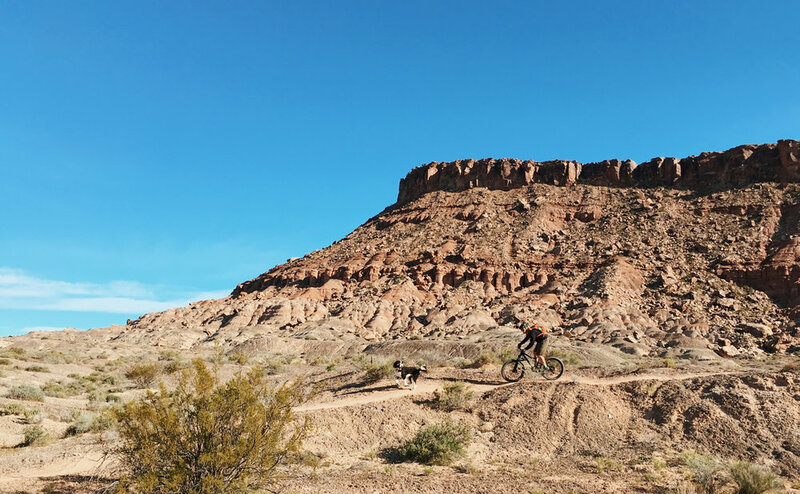 A local friend of theirs, World Cup downhill racer and bike mechanic extraordinaire Evan Turpen, joined their efforts, and Trek came on board as their main bike brand. To further serve the community, Epicenter led the effort to transform a weed-choked spot right in their backyard into a public pump track, which was a vibrant, popular scene for kids and adults alike for several years. Epicenter also partnered with local mountain biking non-profit Mountain Bikers of Santa Cruz (MBOSC) to bring the fledgling Santa Cruz Mountain Bike Festival to the vacant field between the pump track and dirt jumps. Epicenter continued to sponsor the event, which enjoyed several years at the Aptos location. The pump track and Post Office jumps are sadly history now, as the land they were built on had been slated for development, and time eventually ran out on the free lease. 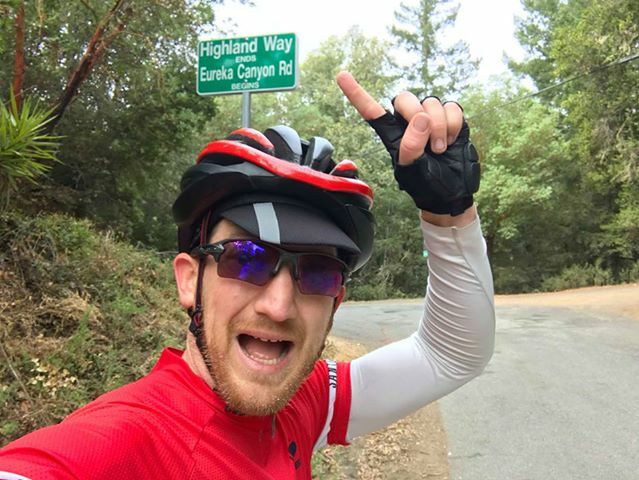 But Epicenter’s Aptos store and its crew have indeed made their mark serving cyclists from all over who come to ride the area’s epic trails and roads. Epicenter Aptos’ success inspired the opening of a location on the west side of Santa Cruz as well, in the spacious former Blockbuster store on Mission Street. Shawn and Kazia brought on local artist Steve Hosmer to paint an eye-catching mural along the parking lot side of the building. 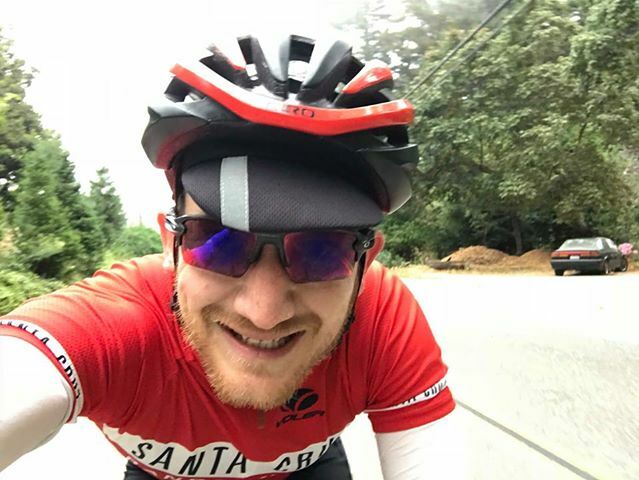 The image of a cyclist holding a surfboard hinted at a time to come when Santa Cruz County would be as renowned for cycling as for Santa Cruz. And so it is … and then some, thanks to the efforts of dedicated cycling advocates all over the county. We at Epicenter are proud of our positive, friendly environment with accommodating sales staff and knowledgeable mechanics. Both locations carry a wide range of bicycles and electric bikes, so you can rest assured that we have THE bike that’s perfect for YOU. 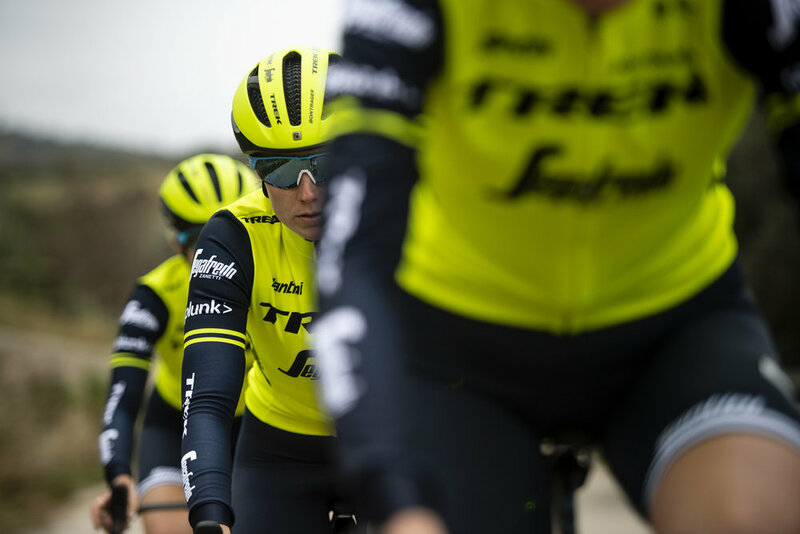 We stand behind the brands we carry — including Trek, Electra, and Blix — as being those that ensure the most bang for your buck, offer the best warranty, and boast the coolest features in the industry. Test rides are always free — no matter how many bikes you want to try out! We also offer the very best in accessories, clothing, parts, and service. 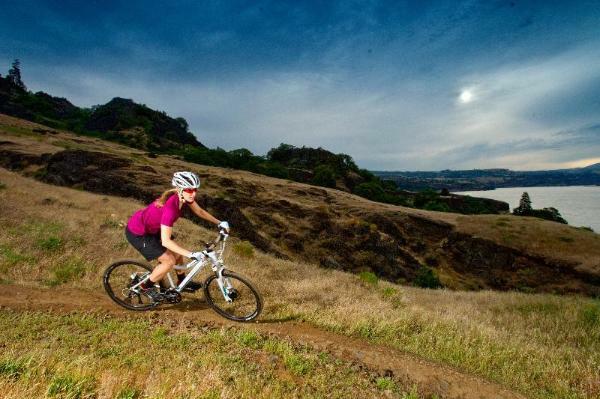 Plus, we now offer an on-line reservation system for our bike rentals and a brand new shuttle service that offers a lift from our Aptos store to the world-class trails at Demo. Join us in celebrating our ten years as your local bike shop, and look for special deals and events throughout the upcoming year! And if you're happy with the service Epicenter has provided you, the best “birthday gift” would be a positive review on Google and/or Facebook, and to vote for us as Best Bicycle Shop in the 2019 Good Times Best Of poll. We truly appreciate your business, support and friendship. Photo of Ryan “R-Dog” Howard by Ian Collins. We know you LOVE your bike. Your bike makes you feel like a hero! You know the feeling: the dirt is tacky, you're carving turns, catching some air ... you can do no wrong. HERO. And you ARE a hero, whether you're a weekend warrior, racer, or explorer. Getting on your bike means breathing fresh air, finding focus, and recharging in solitude or with friends and family ... all of which give you the energy to be the best that you can be. To support you in being the dirt-slaying hero you are, here is a guide to maintaining the health of your steed. 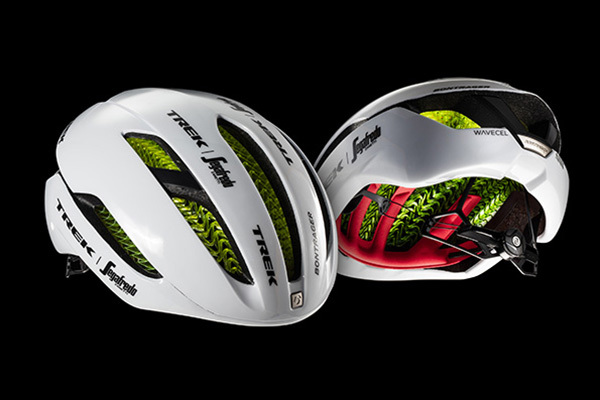 With your left hand holding the front brake as you rock the bike back and forth, you can feel for play between the headset and frame with your right hand. These include: headset (feel for roughness, or vibration); front wheel (hold fork and spin front wheel; should spin nice and freely, no roughness); pedals (should spin freely, no noise); bottom bracket; rear wheel; rear shock, if full suspension. If this sounds like Greek to you, come by and we’ll demonstrate. Ideally, the wear on your brake pads should be equal. Notice how, in this case, the left side is more worn than the right. This may indicate an alignment issue. For this tire, the acceptable pressure range is 30-50 psi. It’s helpful to have a pump with a dial at home. Always, ALWAYS make sure your front and rear skewers are secure and tight. Lube your chain every 40 miles or at end of your ride if the bike gets wet or muddy. To effectively lube your chain, first be sure to clean it before applying the chain lube. You can use a chain cleaner such as Park Tool’s CB-4 Bio ChainBrite, or at the very least wipe the chain down with a rag. Take a look at your fork (front shock) and rear shock (if you have a full suspension bike). If you notice a lot of grit, grime, or build up around your the seals, it’s time for some professional service to keep that cush under your tush. And of course, it shouldn’t feel like you’re riding a jackhammer. Our mechanics can work their magic and get that buttery feel back for you. Fork (front shock): Let’s face it — forks are expensive, and unless intentional, not ideal to replace. Proper fork maintenance will make your fork last as long as your love … a LIFETIME! Your fork maintenance schedule is determined by your riding style and conditions. If you aren’t sure of how often you should service your fork, stop by and chat with one of our experienced, knowledgeable mechanics for a recommended schedule tailored for YOU. At eight months, have the wiper seal replaced (this seal is responsible for keeping dirt out. If you ride aggressively, and in particularly dusty or dirty conditions, you’ll obviously want to service your fork more frequently. Keep in mind that following a recommended fork maintenance schedule will keep your fork running smoothly for much, much longer than if you don’t. Rear shock: The rear shock on a full suspension bicycle allows your back wheel to soak up impacts, providing you with more comfort and control on your trail days. We recommend servicing the air can every 100 hours, and the damper every 200 hours. Again, this depends on your riding style and conditions. Be sure to get a professional overhaul yearly to replace seals and suspension fluid. And a healthy, happy looking rear shock. We recommend you get your dropper post professionally serviced every 200 hours. Servicing this component is intricate, and requires experience and precision, so we don’t recommend any DIY maintenance. Photo of Casey Brown by Ian Collins. We’re proud to carry Blix electric bicycles, and we were thrilled to be chosen as January’s featured dealer! Here’s an excerpt from the Blix blog, and a link to the full Q&A with Epicenter’s owner Shawn Wilson. Enjoy! Epicenter Cycling has been a supporter of Blix Bikes since the beginning. Located in Aptos and Santa Cruz, California, right down the street from our headquarters, Epicenter has shown dedication, knowledge, and experience with customers. As Epicenter Cycling continually strives to support their bike brands and customers, we found them to be a perfect fit for this month's Local Blix Dealer Spotlight. How did you end up in the fantastic world of bikes? Like many kids, I grew up riding bikes. By the age of 15, I knew I wanted my life to be centered around cycling. I raced downhill as a teenager, turning pro at 18. I commuted over the hill from Santa Cruz to Los Gatos for a part-time gig at a bike shop. This led to a full-time position as the store manager. When plans to co-own the shop fell through, I turned to my home turf in my quest to spread the cycling stoke. Epicenter Cycling’s Aptos location was born out of that quest. Its success inspired the opening of a location in Santa Cruz as well. For nearly a decade, Epicenter has been true to its mission to get more people on bikes. We’re all passionate about cycling. Bikes have been a huge part of my life and I can’t imagine a life without them. There’s just nothing like getting other people excited about bikes! Epicenter Cycling is unique in that we truly stand behind what we sell and the services we offer, and we genuinely care about our customers. Our knowledgeable, friendly crew are committed to providing solid pre-purchase guidance, and post-purchase support. We just want our customers to be stoked on bikes! Whatever we can do to enable that, we will. If you could only cycle one last route before autonomous vehicles take over the world which one would it be? 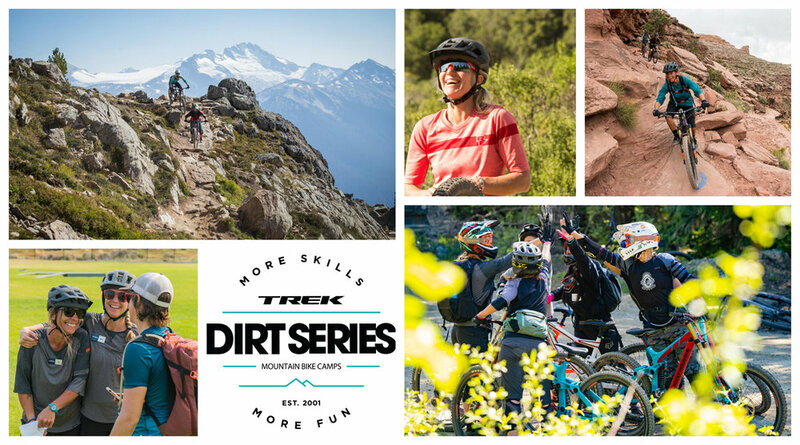 All of us at Epicenter are excited to host the Trek Dirt Series co-ed mountain bike skills camp in Santa Cruz on April 20-21, 2019. We’ve worked with this program consistently since we first opened our Mission Street store (eight years running!) because it offers professional and supportive step-by-step coaching, and has the potential to teach you more in one weekend than you’d otherwise learn in months. Whether you want a solid introduction to the sport or the chance to level up your current skills, don’t miss the opening of registration on February 1. This camp always sells out so be ready to sign up. Trek bikes are available to rent for the clinic at $50 per day and include fitting and suspension set-up. (Call to reserve; subject to availability.) Plus, if you buy a bike from Epicenter after renting, the rental fee will be applied towards your new bike purchase. Visit dirtseries.com to learn more and to sign up. Give the gift of STOKE this holiday season! We now offer gift cards for bike rentals, shuttles, and bike rentals with shuttles for an epic cycling experience. Order on-line and choose whether to have the notification sent directly to your gift recipient or to you so you can present it yourself (tuck it inside a card or gift bag, or wrap it up in a box). Please note availability varies between our locations in Aptos and Santa Cruz. Visit epicentershuttle.com to book a rental or shuttle for yourself! A 10-pack of shuttles is the perfect gift for the frequent shuttler. Punch cards are kept on file at Epicenter Cycling in Aptos. Give the gift of adventure. 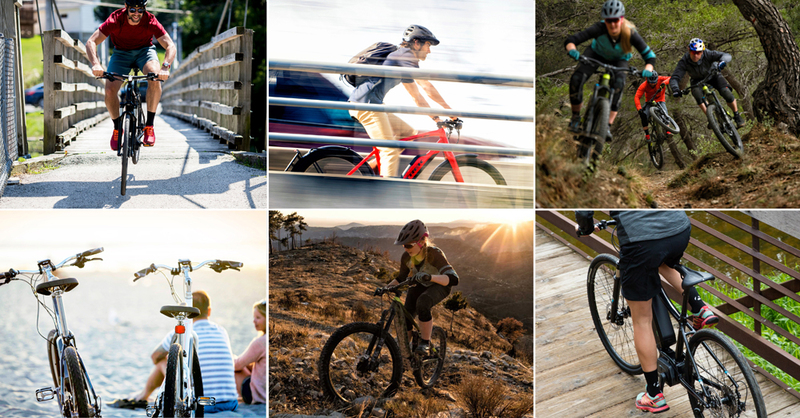 Choose from top of the line full suspension carbon or hardtail mountain bikes from Trek, available for one day or 24-hour rental. Add on a shuttle to make for an even more epic experience on the bike! Please note, the shuttle runs from our Aptos location only. Learn about the rental bike models in detail on our rental bike page. Click the button below for more information about and/or to purchase a rental bike gift card. 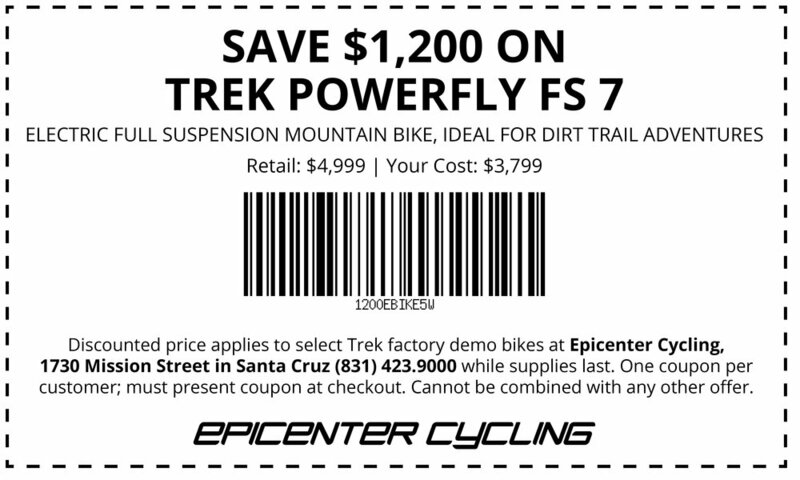 Our Santa Cruz location offers a wide range of top of the line bikes from Trek, available for one day or 24-hour rental. Please note, there is no shuttle from this location. WE know what a fun, versatile, capable, and efficient mountain bike the Trek Remedy is ... nice to see it getting tons of love in this Pinkbike review. Catch a comfortable, scenic lift from our Aptos store to the top of the Forest of Nisene Marks State Park, from which point you can take on the renowned singletrack loops at Soquel Demonstration State Forest before enjoying a beautiful descent through the redwoods back to the shop.